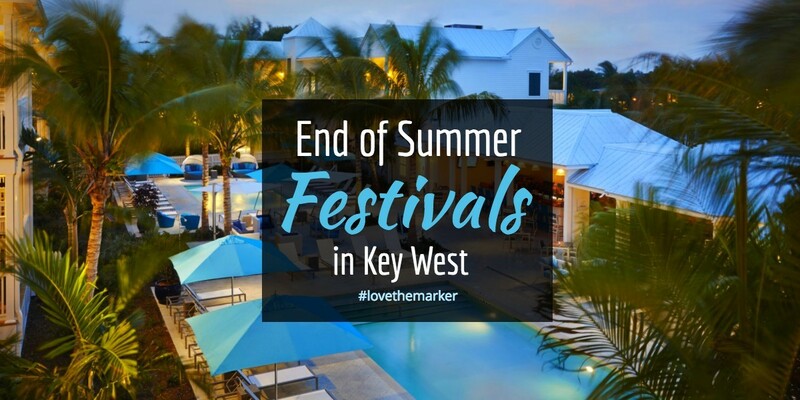 In Key West, we always find a reason to celebrate and since summer really doesn’t end in paradise here are two can’t miss festivals that involve our love of love lobster and Beer! The 22nd Annual Key West Lobsterfest is a celebration of the opening of the spiny lobster season in the Florida Keys. 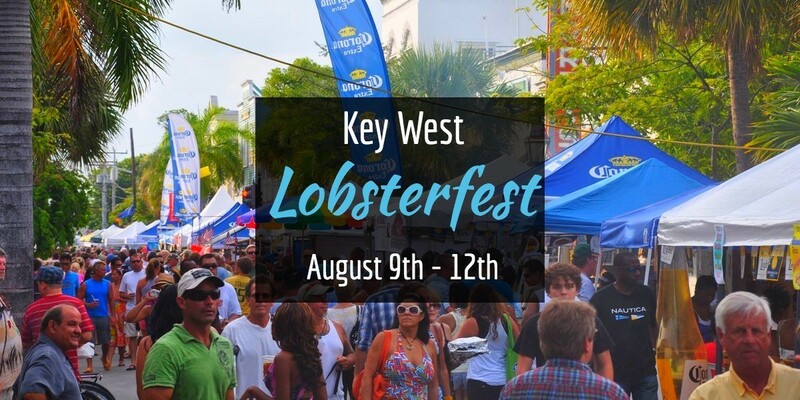 Thousands of lobster lovers head to Key West and join the locals for one of the biggest parties of the summer! The Lobster Fest Events include Free Concert, Sunset Sails, Brunches, a Street Fair, and more! Champagne Sunset Sail - 2 hour sail including beer, wine and champagne, Learn about the 8 ways to enjoy lobsterfest at sea. August 10th, Duval Crawl - $20 for the T-Shirt, Lanyard & Drink Specials, Learn more. The “Crawl” will begin immediately after sunset. Tickets purchased in person are cash only!! Beat the crowd & buy your tickets in advance. Participating Bars include: Bagatelle, Tiki House, Hard Rock Cafe, Grand Cafe, The Sand Bar, Rick's, Durty Harry's, Smokin Tuna Saloon, Margaritaville, Mary Ellen's, Willie T's & Pinchers Crab Shack. August 11th, Street Fair - Noon - 11pm - 100-500 blocks of Duval Street. Street Fair featuring 16 restaurants, 100 arts and crafts booths and a free concert … and lots and lots of LOBSTER! August 12th, 10am - 2pm - Lobster Brunch at First Flight Island Restaurant & Brewery Featuring Mimosas, Bloody Mary's, Lobster Gazpacho, Lobster Eggs Scramble, Lobster Enchiladas & much more. Live Entertainment! Learn more and get tickets early. Get your tickets in advance for the Lobster Boil, Reef & Rita Snorkel Trip and the Lobster Brunch. Stay Hydrated! It’s hot so drink plenty of water throughout the day. Cover Up! Make sure to wear plenty of sunscreen and don't forget hat and sunglasses. Explore paradise and check out the lobsterfest food and drink specials across the island. 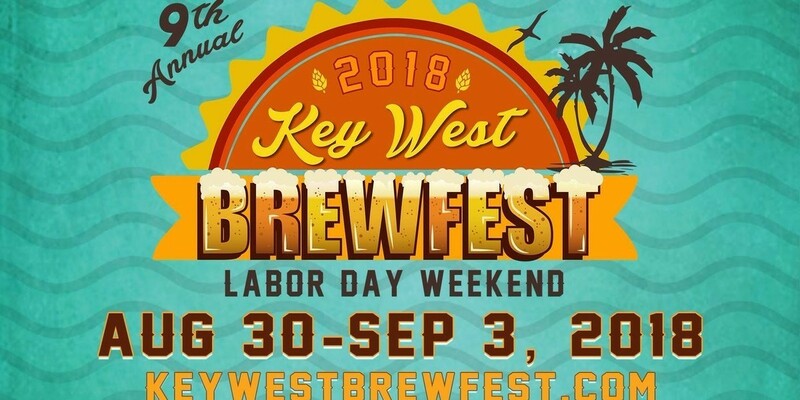 The 9th Annual Key West Brewfest is set for August 30th to September 3rd and it’s a great way to celebrate Labor Day Weekend in the Keys. There will be close to 200 beers to taste in one weekend and festivities that include: beer dinners, beer brunches, happy hour parties, seminars, pool parties, beach parties and the Signature Tasting Festival Event at South Beach and so much more! Stop by all 5 bars and have a pint from the featured brewery to receive a poker card. Turn in your hand at the Sunset Pier by 8pm on Friday. $200+ in prizes will be awarded to the winners. 1pm-4pm: Estrella Galicia Pool Party at Marker Waterfront Resort featuring DJ Chaka, beer specials, tapas, Jenga competition and giveaways. 6pm– Opening Kick-off party at Waterfront Brewery. Waterfront will be releasing new brews during the event. Enjoy Key West specialty draft beers, great food, and fun. Located at 201 William Street. 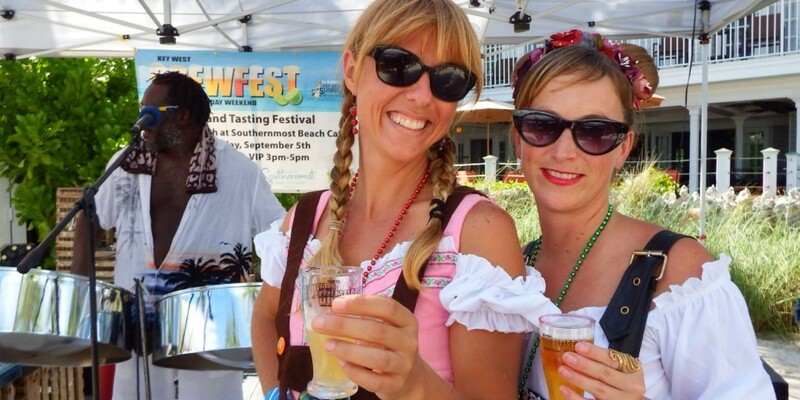 3 pm – 5 pm: VIP admission - Key West BrewFest Signature Tasting Festival on South Beach, located at 1405 South Beach Purchase Tickets ($75 per person, tickets must be purchased in advance, limited number sold). Purchase Tickets($75 per person, tickets must be purchased in advance, limited number sold). ***8pm: Second Line March led by New Orleans band Water Seed leaving South Beach at end of the Signature Tasting Festival. Get your dancing shoes on to march your way from the end of the festival at South Beach, down Duval Street, to the Green Parrot. Keep the night alive with the live brass band leading you to the next party! 1pm- 4pm: Kona Pool Party at The Marker Waterfront Resort, featuring tunes by DJ Jimmy. $20 buys you a plate full of pig roast and a draft Kona beer. As stated above, there are so many Brewfest events on Tap for Labor Day Weekend and above gives you a glimpse of the festivities over the holiday weekend. View the Key West Brewfest Event Schedule. Visit the Key West Brewfest Website to learn more about the beers and events. Know before you go - check out the events in advance and figure out which ones you want to attend. Get your tickets in advance! Some will sell out early. Sample new beers and make a list of the ones you like. Wear comfortable clothes and shoes. It’s hot outside! Meet new friends and enjoy the festivities.